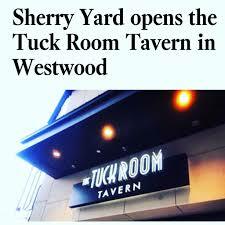 On a recent Sunday afternoon, we stopped to say hello to Master Mixologist Adam Seger and Master Chef Sherry Yard at their brand new Westwood Village digs, The TUCK Room, where you can tuck into a vast menu of deliciousness. The space spans the gamut: cocktail bar-elegant dinner party-stay late-get lost in a deep lounge chair, with its raw wood, concrete, low light, armchairs galore, and art installations. In other words, you get comfy right away. It’s all about the food and drink: A custom Manhattan, rendered à la Amazon, for my partner and a large nonalcoholic coco-lime-mango concoction for me, set an exotic, rich tone, made all the more luxurious by the extremely attentive staff. Chef Sherry laid out an afternoon’s casse-croûte (that’s French for crust-breaker, or snack). – K-Town Short Rib Sliders: The most tender Hawaiian roll I have ever bitten down on, melt-in-your-mouth beef, and a super light cole slaw joined up for a sandwich I could easily live on the rest of my life. Fusion City, we have arrived. – Buttermilk Fried Chicken with Spicy Bacon Maple Syrup puts the tender back in chicken tender: Thick, crispy, juicy fingers of chicken in a batter that adds texture, crisp, but no weight at all. The bacon syrup layers on a salty sweet that wraps this dish in yummy. – Potted Smoked Trout Spread presented on a charcuterie board with pickles, crunchy seeded flat bread, and a personal-sized glass jar of sublime chunky trout salad—salty, dense, sea breeze-fresh trout, simultaneously intense and subtle; it makes you sure you are eating caviar. And this fraction of choices is from a menu with a couple dozen more. Go to eat a full meal, go to just have a casse-croûte, a drink, a lounge.